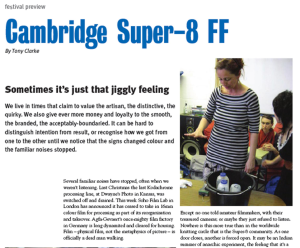 Cambridge Super 8 Film Festival in Film & Festivals, by Tony Clarke. SOMETIMES IT’S JUST THAT JIGGLY FEELING. We live in times that claim to value the artisan, the distinctive, the quirky. We also give ever more money and loyalty to the smooth, the branded, the acceptably-boundaried. It can be hard to distinguish intention from result, or recognise how we got from one to the other until we notice that the signs changed colour and the familiar noises stopped. The full article appears in the current (March/April 2011) issue of Film & Festivals magazine. Read the full article on Cambridge Agenda. Article in the Explorer Magazine.